This page came into existence because I bought a DR-110 with schematics in 1999 and had the desire to modify Roland's final analog drum machine, but didn't have the know-how. In the years since, you can find those schematic scans all around the web, and many people have posted modification ideas, and many more have modified their DR-110s. Before posting those schematics, it wasn't unusual to see Boss DR-110s sell for $50 and under. For better or for worse, those days are long gone. Consider this page a really big supplement to the manual - there's really more than you'd ever want to know about the DR-110 here. Release Date: Sometime in 1983. There were several revisions of the manual - The back of the first manual I had said "DR-110 OWNER'S MANUAL '84 SEP. A-4" and I have another that's marked "'83 NOV. B-4". 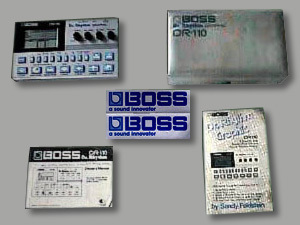 A PDF version of the Boss DR-110 manual is labeled "'86 MAR. C-3"
Number Manufactured: Well, at least 5000, going by my serial number. Create Your Own Rhythms and Charts"
It is pretty cheesy, and was sold for $2.95 retail by Alfred Publishing Co., Inc. (Book #2453) This was also published in 1984. Test Mode: When you turn on your DR-110, hold down the start and stop buttons. The entire LED screen should show, though dimly. Press all your blue buttons, and if they all work, a big OK should appear. SCHEMATICS ARE GIF IMAGES in ZIP FORMAT. They have been photographed and scanned directly from the official Roland service manual. Please, if you download these schematics and perform even a modest modification, at least let me know. This zip includes the schematics, waveform diagrams, the parts list, disassembly instructions. Download, modify, spread the word. The title pretty much nails it. Add further control to your bass drum pitch, snare impact, OHH decay, Clap pitch, plus trigger output & more. Text and schematics included. A fellow named Rob sent this to the Analogue Heaven mailing list years ago, and it includes fifteen different adjustments to the DR-110's sound generating circuits. Connect an amplifier or headphones to the output of your DR-110. Turn the POWER on and set the VOLUME to a little under half. Turn TEMPO, BALANCE, and ACCENT to their mid-points. In the beginning, you may wish to set the TEMPO slower. The second line is a good place to start. Hold SHIFT button down and press button 4. STEP WRITE will appear in the lower right hand box of the LCD screen. This tells the DR-110 you are going to write a rhythm. Press BANK SELECTOR button (A|B|C|D) to A. A will appear under BANK (lower middle box of screen). If B appears, press button again for A. Press button 1. 1 will appear on the screen under RHYTHM. This tells the DR-110 you are going to store the beat in SELECTOR 1. Hold SHIFT button down and press 7 (under PATTERN CLEAR). This will erase anything previously stored in SELECTOR 1. Hold SHIFT button down and press 6 (12/16). You will see a little arrow at the top of the graph on your screen. The arrow will alternate between 12 and 16. Press 6 until the arrow is above 16. This tells the memory that you are writting a pattern with 4 beats in each measure and that each beat is divided in 4 parts for a total of 16. Since the procedure for preparing the DR. RHYTHM is always the same, the sooner you memorize this procedure, the more fun you'll have. When you press the Start Button, a solid dot will appear. When you press the STOP key, the flashing dot will move to the next position. Each dot entered will indicate a note. Make sure that Rhythm is not playing. Select the Rhythm Pattern to be written into the second measure. Likewise, keep writing up to the measures just before the final one. If you are to write the same Rhythm Pattern as the one before, just pressing the ENTER key will be sufficient. Select the Rhythm Pattern for the last measure. Press the STOP Key. Now try playing the Rhythm. BOSS DR-110 DR. RHYTHM GRAPHIC/ANALOG DRUM MACHINE IT WORKS GREAT!